Creating Venn diagram with free templates and examples. Venn diagram has never been easier. Venn diagrams, introduced in 1880 by John Venn in one of his papers, with overlapping circles that indicate how much different groups have in common. A Venn diagram shows all possible logical relations between a finite collection of sets, and are used to teach elementary set theory, as well as illustrate simple set relationships in probability, logic, statistics, linguistics, computer science, engineering presentations and theoretical mathematics. Where the circles overlap, items have a specified something in common. Where the circles do not overlap, the items do not have a specified something in common. Generally, a Venn diagram has two or three circles. You can specify the relative sizes of the circles and the amount of overlap between them. 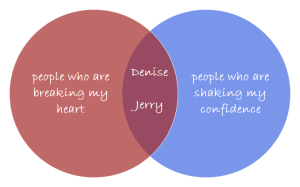 Venn diagrams can be created and included in your spreadsheet, e-mail message, presentation, or document. Use Edraw Venn Chart template to get start quickly. It contains a vast variety of pre-made shapes and symbols that you can apply directly. You can modify your image sizes, colors and styles by only a few clicks, and the real-time preview makes it a lot faster to see, for example, how changing a color scheme will affect your drawings. You can also apply the pre-defined themes if you want. Once you're finished, the diagram can be printed or exported to PDF or other image format with only a single click. 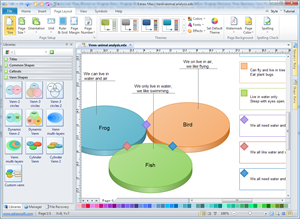 Plenty of Venn shapes are provided for the Venn templates, including Venn circles, dynamic Venn, Venn multi-layers, cylinder Venn, custom Venn. All these shapes will surely make your Venn diagrams more professional and attractive. For the good of easing users' drawing process, we now offer a venn chart template readily available in vector format. 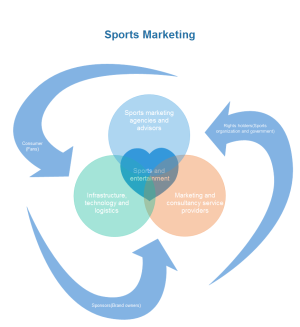 To benefit more users, a sports marketing venn diagram template is also provided, with more creative distribution and more impressive appearance.